Tobago located some 20 km north of Trinidad is a small mountainous island, approx. 40 km long and 10 km wide. It is home to 60.000 inhabitants, most of them descending from slaves brought from West Africa. The volcanic origin of the island together with tropical rainfalls provides for a lush and tense vegetation. Main source of income are agriculture, fishing and tourism. However, mass tourism has not yet (or not anymore) reached Tobago which gives you the chance to enjoy some world class beaches basically on your own. You may easily find your own little paradise there. If you like watersports (surfing, wind surfing, kite surfing, diving) then Tobago definitely is the island to go. 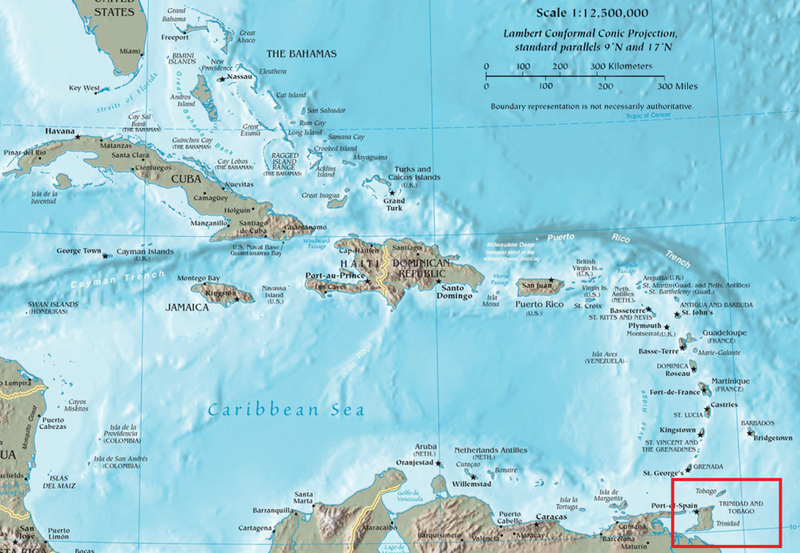 Since Christopher Columbus sighted Tobago in 1498 the island had a vivid history. While the indigenous population (Arawaks, Caribs) were all extinct in the 16th/17th century Tobago was in the center of fierce battles between different European marine powers (Spanish, Dutch, British, French). It switched hands 33 times (!) until it finally in 1814 became a British colony for nearly 150 years. In the island’s capital Scarborough, where big cruise ships anchor, three canons (dived out of the harbor basin in the 1990s) and a memory stone provide witness of the bloody battles between the Dutch and the French in this bay. The French and later the British heavily fortified the port of Scarborough to defend it against invading powers and pirates. One of the reasons to visit Tobago was to meet an old friend of mine, Karl (“Charly”) Pilstl, whom I know from our university time in Linz/Austria. We were both part of the university soccer and ski-racing team and had not met for more than 20 years. Charly who is married to a lady from Trinidad & Tobago in the late 1990s bought and carefully renovated the Blue Haven Hotel near Scarborough https://www.bluehavenhotel.com/ . This hotel has a long tradition and was in the center of several Hollywood productions with Rita Haywood, Deborah Kerr and Robert Mitchum. The beautiful low-energy hotel enshrines part of the old harbor fortification and has its own private beach. Tobago has some of the finest beaches in the Caribbean. Pigeon Point is a popular beach in the west of the island which on weekends can be quite crowded. Pigeon Point is also the center of water enthusiasts. For most of the year it has strong and stable wind coming from the north or east which is ideal for kite surfing and wind surfing. When I was there wind speed varied between 17 and 22 knots. I do not show the pics of me kite surfing lessons (they are still too embarrassing 😊). Some 5 km to the east there is Mt. Irvine which has great waves for surfing. I took a two-hour surf course where all in all I was able to stand a few seconds on the board. Eventually I had to admit that this is not a sport I am talented for although George (see picture) did his best to get me hooked. Sunday attraction is the traditional goat race, which turns out to be quite a sportive event. As tourists would not be a match for the locals participating in the goat race there is a special crab-race for tourists. Participants use all kind of persuasive means to encourage the crabs to run faster. Limbo dancing is a dance developed in Trinidad & Tobago. Initially danced one week after a funeral it now has become a popular entertainment element for tourists. Without touching it a dancer has to dance below a bar which will be lowered each round. As a rule, neither the knees, nor the back or the head are supposed to touch the ground. The world record of the lowest limbo (2010) stands at 21.5 cm. One can easily travel around the island in one day following the coast line. If you are at the right spot at the right time you can watch the fishermen bringing in their catch and processing it right at the beach. The stunning coastline is a sequence of small bays occasionally secured by small fortifications. At Englishman’s Bay, one of the most beautiful beaches of the island, there were only two persons at the beach. Parlatuvier Bay is a perfect natural harbor. Charlotteville and Speyside are the western-most villages of the island. The islands next to Speyside have been the location where Ian Fleming lived while writing some of the James Bond novels. The local grocery offers many kinds of vegetable unavailable in Europe. The Main Ridge Forest Reserve allegedly is the oldest national park in the world. The rain forest has been left untouched based on the initiative of the British scientist Soame Jenyns in year 1776. The last picture shows a plant attacked by leafcutter ants.